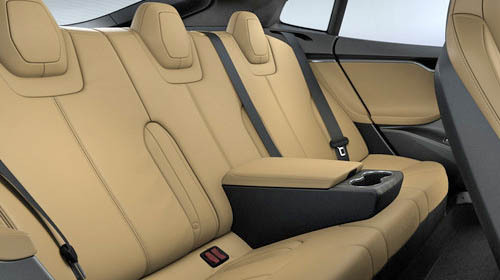 There are now multiple options specifically designed for the Model S second row rear seats. The Model X 2nd row already includes two pop-out cupholders, and the third row includes 2 built in cupholders. Tesla used to offer an option that installs two adjustable cup-holder straps to the front of the rear-seat bottom. Owner reviews have been generally poor although some owners do like it. The placement is a bit low. These are no longer available on the Tesla site. Teslaccessories offers a great, although expensive solution. They replace the center arm rests with ones that include cup holders. It’s available in matching black, grey or tan colors. More information is available at the PARZ – Rear Seat Cup Holders page. 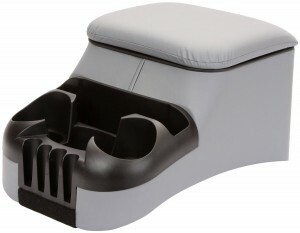 Here is the PARZ armrests in grey. 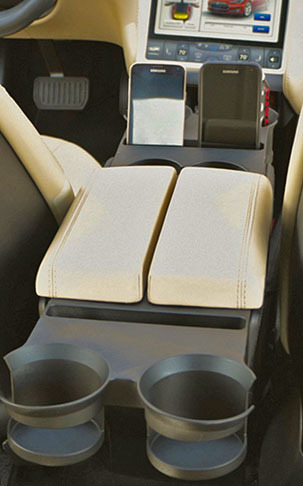 NoFNGas has the Tesla Model S Rear Cup Holder Console. It is small enough to not take up a seating position as it fits on the floor between the back seat and the center pedestal. It can be installed and removed quickly. A lighted cupholder version is also available (not shown), and several different materials are available at NoFNGas.com. Revozport offers a LCD screen and cupholders module for the rear passengers. Designed specifically for the Tesla Model S, it cleverly surrounds the center console without interfering with the vents or front armrests. (This appears to be out of production now). TeslaCupholders makes both a front and rear pair of relatively low-cost cup holder additions that attach to the center pedestal. Each includes a slot for cell phones. They also offer a number of visual choices. There are also products that fit into the back set, but are not specifically designed for the Tesla. 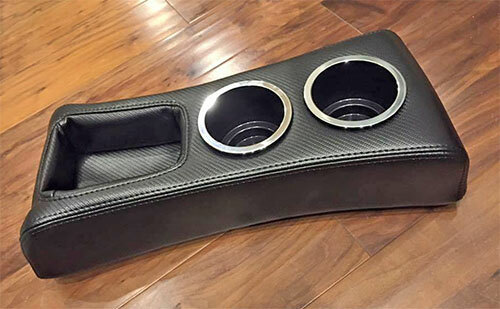 I purchased the “Tesla Outlets rear cupholder console” off of ebay and couldn’t be happier – he put a plain black leather on mine instead of the carbon fiber look – it’s great. Doesn’t detract from the interior elegance like the other options, allows for 3 people to sit in the back, and is easily removable – couldn’t be happier. I had the led’s added and the kids love it. I highly recommend it. I’m hoping he does a mini-version that fits in the front – you won’t be disappointed. I think I just saw that there is a ‘foam’ version of that console now for much cheaper on ebay. I think it’s exactly the same thing without the leather covering – if you want cheap but effective, I’m sure that would work very well. 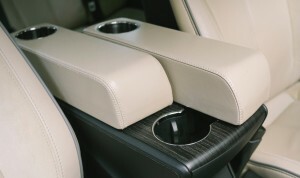 Has anybody looked into the cupholder option floor console that I’ve seen on eBay recently? Good find! I hadn’t seen it before. I’ll find out more and see about adding it to our list.